Material: Self Adhesive Paper – Gloss or matt. 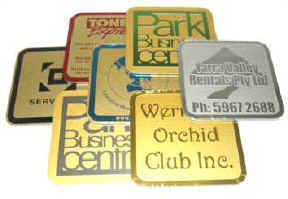 These stickers are supplied standard square cut, back slit singles, on rolls or on sheets. Stickers can also be round cornered or cut to any shape. Application: – Name plate tags, – Machinery plates, – Electrical equipment, – Periodical testing notification. Standard square cut, back slit singles. Stickers can also be round cornered or cut to any shape. Material: Gloss Metallic Silver/Gold Printed Mylar Stickers – Attractive mirror chrome finish polyester sticker displaying good adhesion and outdoor durability. Features: – High outdoor durability, – Excellent heat resistance, – Permanent adhesive. Application: – Window graphics, – Bumper stickers, – Product labeling, – Outdoor advertising, – Hot water cylinder etc. Standard square cut, back slit singles. Stickers can also be round cornered or cut to any shape. Material: White or Clear Printed Vinyl Stickers – Features: – High gloss finish, – Excellent adhesion to most surfaces, – Years of outdoor durability. Application: – Window graphics, – Bumper stickers, – Point of sale, – Outdoor advertising, – Exhibition graphics, – Product graphics, – Durable labelling. Standard square cut, back slit singles. Stickers can also be round cornered or cut to any shape. Material: Lensed, Domed Printed Vinyl Stickers – An attractive and durable vinyl sticker coated with a protective epoxy coating. Electrostatic Printed Vinyl is a Static Cling Stickers material which uses static electricity instead of adhesive to adhere to surfaces.